Troops neutralise invading Boko Haram insurgents in Borno – Royal Times of Nigeria. 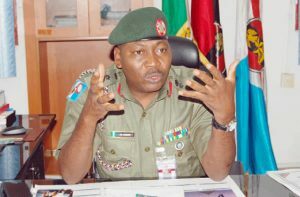 The Nigerian Army said troops of 81 Division Task Force Battalion have neutralized some Boko Haram insurgents who attacked them at Gulumba Gana in Bama LGA, Borno State. In a statement by Army spokesperson, Brig-Gen. Sani Usman, the Army said the soldiers killed many of the terrorists and went in pursuit of those who escaped. Usman said the troops recovered 2 AK-47 Rifles and 2 magazines of 9 round of ammunition, 2 AGL bombs, several empty cases of Shilka gun ammunition, AGL bomb and 1 damaged mobile phone handset. The statement reads, “Yesterday Monday 3rd July 2017, in the evening a group of suspected Boko Haram terrorists’ mercenaries of Mamman Nur extraction paid dearly with their lives when they dared to attack 81 Division Task Force Battalion’s location at Gulumba Gana in Bama LGA, Borno State. “The troops successfully dealt with the terrorists and pursued those that escaped and recovered 2 AK-47 Rifles and 2 magazines of 9 round of ammunition, 2 AGL bombs, several empty cases of Shilka gun ammunition, AGL bomb and 1 damaged mobile phone handset.